Gaston Gaudio has officially retired from professional tennis and played an exhibition match with Mariano Zabaleta in Buenos Aires last weekened to say goodbye to his fans. During the press conference, the 2004 Roland Garros champion recalled his time on the court facing Rafael Nadal and Roger Federer. 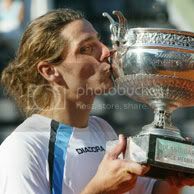 Gaudio beat Nadal 0-6, 6-0, 6-1 in Buenos Aires in 2005, and commented that the Spaniard broke all of his rackets in the locker room after that encounter, but it was clear to the Argentine that he had a thirst for glory. "What's wrong with this kid, is he crazy?" Gaudio thought. "It’s not like he lost to a nobody. I had been playing on clay and won Roland Garros, but Rafa felt like a failure." 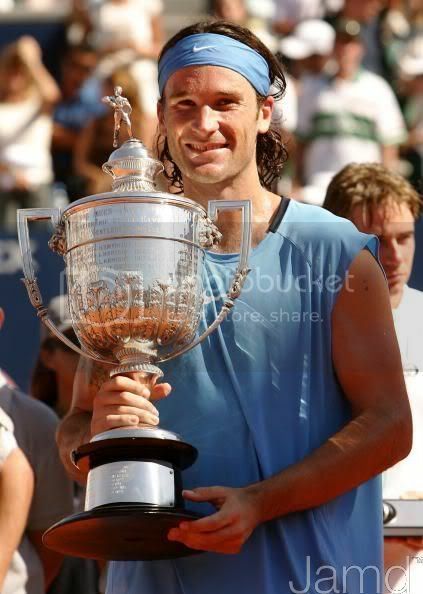 Gaston Gaudio, who won the French Open in 2004, announced his retirement from professional tennis in an interview with Argentine television. Gaudio said he retired "long ago" but waited to see whether he would change his mind before making any announcements. "At first it was complicated, many years playing and many joys and sadnesses, but it passed," he said. "I could play exhibitions, but I'm not coming back." Bobby Reynolds (USA) advanced to the main draw at the BMW Tennis Championship with a straight set win over Gaston Gaudio (ARG) 6-2, 6-1 in the third round of qualifying. The tone of the match was set early in both service games. Gaudio, a past Grand Slam Champion, opened the match with back-to back double faults and Reynolds went on to capture an early break 1-0. Conversely, Reynolds smashed two aces in his first service game and dropped only one point to go up 2-0. Reynolds lost only three points on his serve in the set. Gaudio took the first game of the second set but that would be the only time he would have a lead in the match. Gaudio rallied in the second game down love-40 before rattling off four straight points and gaining his first and only break opportunity. Reynolds quickly answered with three straight points to hold serve and even the set at 1-1. Then a combination of strong play from Reynolds and numerous miscues from Gaudio followed. Reynolds lost only one more point on his serve the rest of the match and closed out Gaudio winning the final ten points played. Reynolds finished the match with five aces, winning 72 percent of his first serves. Gaudio, who seemed to struggle to find his game, only converted 50 percent of his first service and racked up four double faults to go along with three foot faults. With the win Reynolds advances to the main draw of the BMW Tennis Championship. This is the fourth time in five years he will be in the main draw. For the second consecutive year, Bjorn Phau (GER) advanced through qualifying to earn a spot on the main draw. The top seed needed three sets to defeat Alex Bogomolov, Jr (USA) 6-1, 5-7, 6-3. This will be the third main draw in Sunrise for Phau who was a quarter finalist in 2005. Kevin Kim (USA), seeded third, took out fifth seed Robert Kendrick (USA) 7-6 (7), 7-5. Kendrick had 12 break point opportunities on Kim's serve, but was only able to convert one of those chances. Kim will be making his second BMW Tennis Championship main draw. Kim was granted a main draw wild card in 2006. Harel Levy (ISR) defeated Tim Smyczek (USA) 6-3, 7-5 to earn his second main draw opportunity at the BMW Tennis Championship. Levy, seeded fourth, converted six break points in the match. Smyczek had numerous second set opportunities to break Levy but only converted on one. Levy's previous main draw appearance was in 2008. Tickets for the 2010 BMW Tennis Championship start at only $10 per session and are available for purchase online (BMWTennisChampionship.com), by phone (Toll Free: 877.877.7677) and in-person at the Sunrise Tennis Club: 9605 West Oakland Park Blvd, Sunrise FL (Ph: 954.572-2286) and Pro Tennis World: 11306 State Road 84, Davie, FL (Ph: 954.474.1780). Follow us online at Facebook (BMW Tennis Championship) and Twitter (BMWTennisChamp). The BMW Tennis Championship, played at the award-winning Sunrise (FL) Tennis Club, is in its seventh year as a key stop between two ATP World Tour Masters 1000 events (the BNP Paribas Open and Sony Ericsson Open, played just 45 minutes short of Sunrise). The date of the BMW Tennis Championship enables the entry list to consistently host a field of top players. In the past six years the tournament has attracted 22 current/past top ten players, including three Grand Slam Champions -- Juan Martin del Potro, Gustavo Kuerten and Thomas Johansson. Lacoste has announced the signing of thirteen new players from nine different countries in 2010. Among the women are Aleksandra Wozniak, Vera Dushevina, Yaroslava Shvedova, and Mallory Cecil. While, among the men are Dudi Sela, Julien Benneteau, Thierry Ascione, Gaston Gaudio , Federico del Bonis, Jesse Huta Galung, Milos Raonic, David Souto, and Julien Obry. All of these players will represent the popular brand on and off the tennis courts. They will join the already large crocodile family and will become ambassadors of LACOSTE's values in their respective countries and around the world along with other champions from more than 25 different nationalities such as Andy Roddick, Stanislas Wawrinka, Sam Stosur, Gisela Dulko and Dominika Cibulkova. With a strong and unique heritage in the world of sports due to its origins and to its founder, the famous "Crocodile" tennis champion René Lacoste, LACOSTE today implements an active sponsorship policy. The brand also sponsors junior players that have a potential to be future champions, such as Daniel Berta (SWE) and Kristina Mladenovic (FRA) who are both number 1 junior players. LACOSTE also has a strong presence at prestigious international tennis events such as the Australian Open, Roland Garros, and the ATP World Tour Finals which together add up to over 2 billion potential TV viewers. Christophe Chenut, CEO of LACOSTE was clear in his company's rationale behind the signing of this probable future glut of stars. Marat Safin has withdrawn from the Peugeot Copa Argentina Tennis Exhibition to be played at the Buenos Aires Lawn Tennis Club, on December 17 to 20. Gaston Gaudio will be the one to take his place. Safin was elected vice president of Russian Olympic Committee and should be in his country between 17 and 19 of this month. Safin sent a signed note stating this commitment to the organizers of this exhibition event for them to present at the news conference next Wednesday. The 7th edition of the Argentina Cup will feature David Nalbandian, Gaston Gaudio and Juan Monaco, plus the Spanish Carlos Moya, the Chilean Fernando Gonzalez and Marcos Baghdatis. This year, instead of eight players, will involve six, which will be divided into two zones of three each. The championship will be played by the double elimination and best of each group, to be played between Thursday and Saturday, define the event on Sunday. David Nalbandian played competitive tennis this past weekend for the first time in more than 7 month ... Nalbandian was part ofr the Copa San Juan Minero Exhibition where in the final he scored a 6-2, 6-2 win over Gaston Gaudio. "I'm happy. I think playing back in Argentina is very nice. It is encouraging tp play at home with this people who support you at all times. I'm happy to play again, being inside a stadium, enjoy sport, tennis and to sweat a little is good, " he said. He also added that little by little he is feeling better although he is not 100%. In the semis Nalbandian beat Nicolas Massu 62 61 while Gaudio made it past Guillermo Cañas 75 64. "I'm fine, I got up normal (after yesterday's match against Nicolas Massu), it hurt a little my wrist but in a couple of games I adapted and did not bother me anymore. I do not have a sore hip that is more imporante. I have to keep playing, keep adding hours in court, "he said. "I was difficult today, Gaston has a great talent, is a guy who plays very well and has a ranking that is a lie, because without doubt he should be higher." Nalbandian captured two service breaks in both sets that enabled him to take The trophy that determined his official return to the tennis world. 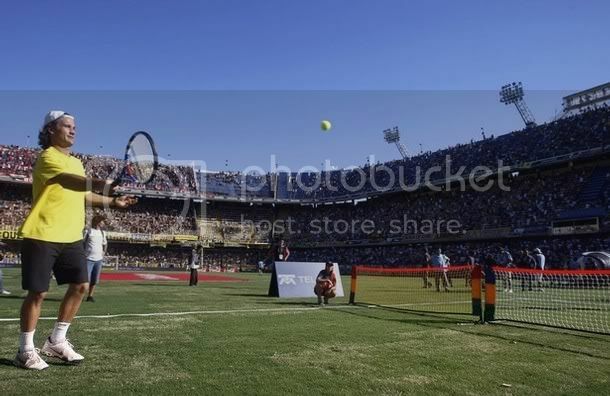 Next week David will play another exhibition tournament, the Copa Peugeot Argentina in the Buenos Aires Lawn Tennis Club. Already in 2010 Nalbandian is scheduled to return to the professional ATO World Tout in the tournament in Auckland and later at the Australian Open. Which is the most relaxing city on tour? Indian Wells. It’s the perfect place to relax, play tennis or have a game of golf. I really like golf and started to get quite good at it, but haven’t played much recently. Which is the most stressful city? New York. Everything’s at 200mph there. It’s hard to keep up with the pace! There are always loads of traffic jams too. I do like New York, but for no longer than a week. Which city has the best nightlife? Miami! With so many beaches, bars and restaurants, it’s a really fun place to be. In which city would you most like to buy a house? Paris. I dream of buying an apartment on the Île Saint-Louis, but it’s too expensive for me. Honestly! The Tour d’Argent in Paris. Which is the friendliest country to visit? Tunisia. I played a tournament in Tunis recently and the people were really friendly. What is the worst thing about travelling? The airports. I also hate packing and unpacking. Who are your travelling companions? My coach and my fitness trainer. What item do you always have in your suitcase? My mobile phone and my iPod. Which is the hottest stadium? Where are the best spectators? At Roland-Garros. The spectators are really knowledgeable. Who is your best friend on the circuit? Who is your ideal mixed-doubles partner? I'm so happy with this news!!! Roland Garros Roland Garros organisers said that Gaston Gaudio has been received a wildcard for the Frenc Open. Gaudio, who won at Roland Garros in 2004, is currently ranked 395th in the world rankings because he did not play for more than a year. His career-high was number 5 in 2005. 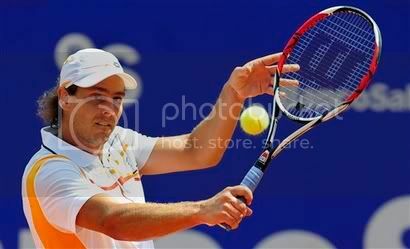 The Argentine has not lifted a title on the main ATP Tour since he won the Kitzbuhel claycourt tournament in 2005 but recently he claimed a challenger in Tunisia. 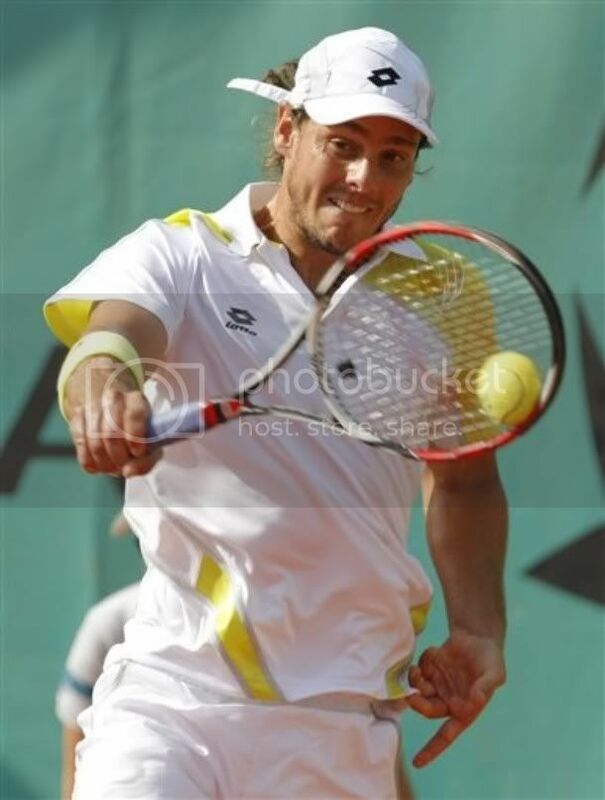 Gaston Gaudio claimed the challenger in Tunisia with a 6-2 1-6 6-3 win over Frederico Gil. Gaudio, whose last title was in the ATP Kitzbuhel 2005, will climb more than 350 positions in the rankings after this great performance in the African tournament. Besides that he felt comfortable playing on clay, he lost just two sets during the whole tournament, Gaudio also showed a sign that he can also get out of complicated moments. For instance, in the final he went from taking the first set by 6-2 to lose the second 6-1. Until not long ago, losing a set like that would have meant a defeat for him but today, however, he did not despair, he followed his game, waited for his rival to slow down a bit and then closed the match as a champion. Clearly Gaudio did not play for money so he doesn't care that the check is for just $18,000 dollars. Because the title is worth valuable points to climb in the ranking. he will got up from 762nd to 406th tomorrow and will have the chance to rise further as he received a special invitation to play in the ATP Estoril, where he awaits his debut against Fabio Fognini. Three weeks left to Roland Garros and Gaudio hopes his former status as champion will help him to get a Wild Card. * Gaston Gaudio is in the final of the ($125K+H) Tunis challenger, his firts final since 2005. * Tommy Haas has pulled out of Munich. * Gaston Gaudio has received a wildcard into Estoril. * Richard Gasquet has pulled out of Estoril with an elbow injury incurred during his third-round match against Verdasco in Rome. Robby Ginepri will also not be playing, still sidelined following appendix surgery in March. * Gilles Simon has taken a wildcard into Estoril. The tournament has one wildcard remaining, with the first having been given earlier to Portuguese Rui Machado. * Lleyton Hewitt has received a wildcard into Munich. Marcos Baghdatis has received a wildcard into Belgrade. Gaston Gaudio, who is ranked 966th after flirting with retirement through most of 2007 and 2008, won his first ATP match since the 2007 French Open after defeating Diego Junqueira 6-4, 3-6, 6-4 at the Barcelona Open. 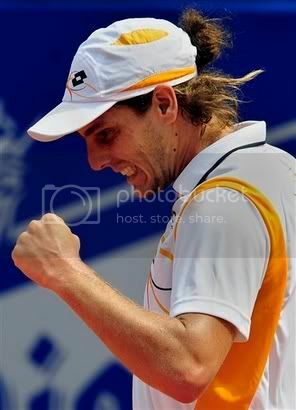 In the next round he will play against Tommy Robredo. "This win is unbelievable, it's great to win a match at this level again," said Gaudio, who received a wildcard into Barcelona. 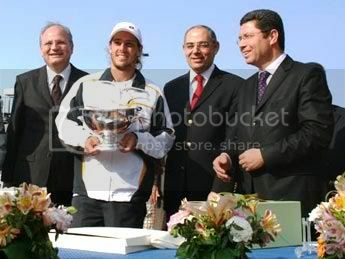 He has also applied for wildcards to the new ATP event Belgrade and the French Open, where he was the champion in 2004. "I'm just hoping for some wild card invitations. I'll go where I'm invited." he added. Gaudio said earlier this year that he had rediscovered his enthusiasm for the game. Carlos Moya, lost to qualifier Maximo Gonzalez 6-4, 6-4. While gaston Gaudio was defeated by Daniel Gimeno-Traver 6-2 4-6 6-2. Gonzalez led 4-0 Moya in the first set and almost blew a 5-1 lead in the second. "Without a doubt, it's the most important win of my career," Gonzalez said. Moya, Champion in 2003 and 2006, blamed his loss on pains in his leg he's been suffering for more than a year. "I haven't competed in a month. Now the priority is to put myself in good physical condition." Moya said. Gaudio, winner in 2005, had a better excuse. He lost a 3 set battle to Daniel Gimeno-Traver in his first match on tour in a year because of injuries. It's been 21 months since the Argentine won a match on the tour and he made a fighting start with breaks in each set, spoiled by 11 double faults. In other results from Tuesday Tommy Robredo defeated Potito Starace 5-7, 6-3, 6-3, but Thomaz Bellucci was beaten by Marcel Granollers 7-5, 7-5. 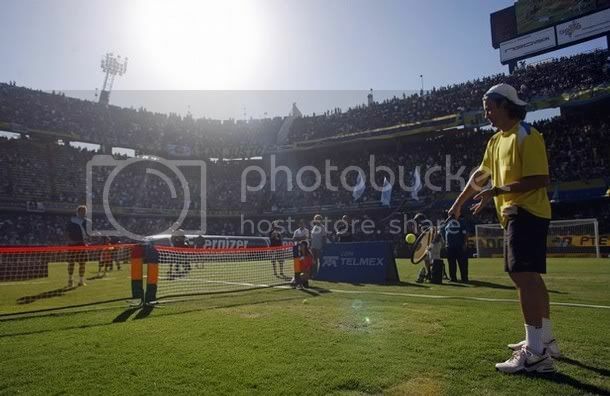 Juan Monaco defeated Gaston Gaudio 7-6 7-6 in the final of the Copa Argentina de tennis, which took place this week on a fast court in Buenos Aires Lawn Tennis Club. Monaco took revenge of the definition of last year, when he lost to David Nalbandian. To reach the final, Monaco had defeated Juan Ignacio Chela and Guillermo Cañas. Today was a very disputed match against Gaudio, who played three consecutive games after a long time. Gaudio compete again last Friday after an inactivity that dates back to January 28 when he lost in the initial round of the ATP Vina del Mar in Chile against Santiago Ventura. Juan Monaco got a car for winning this exhibtion.